Almost rectangular in shape, the lap started with a blast along one of its two long straights leading into a right-handed corner before a twisting run to the next 90 degree right - Boulevard Alexandre Corner - via Boulevard Panoramique. It then ran along the main road to Azemmour before turning right again and leading along the coastal road before the final 90 degree right into the Sidi Abderhaman forest and then a long, high-speed climb through a series of kinks back to the start/finish line. The course was designed by the Royal Automobile Club of Morocco and given a full blessing from Sultan Mohammed V. It took merely six weeks to construct. 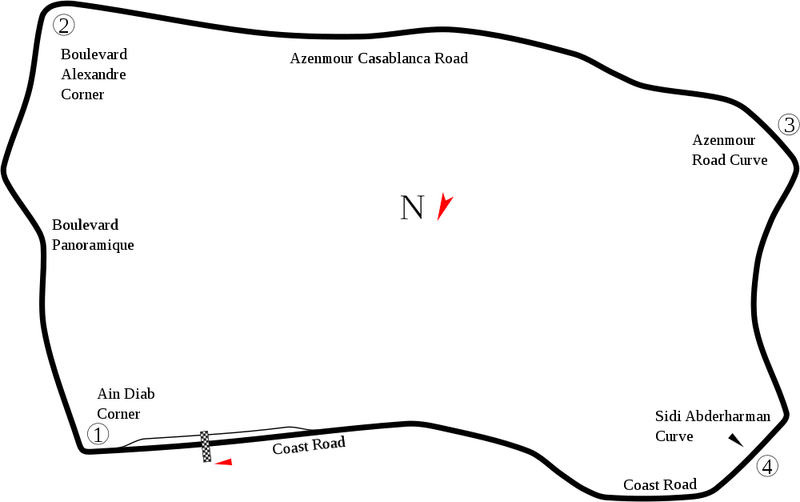 The road circuit hosted its first grand prix, a non-championship affair, in 1957, and in October 1958 it staged its only F1 championship grand prix which was won by Stirling Moss in a Vanwall. However, the race was marred by an accident involving Moss' team-mate Stuart Lewis-Evans - he was severely burned and died in hospital in England six days later.